It might have been outclassed, but it’s still a great phone. The Galaxy Note 8's job was not only to serve the legions of smartphone users who demand S Pens but also to rehabilitate Samsung's image after the Note 7, to prove that the company had bounced back from a very public failure. On both counts, I'd argue the Note 8 succeeded. With Samsung gearing up to reveal its next-generation Galaxy Note, we thought it'd be appropriate to check in with 2017's Note 8 to see just how well it holds up against a year's worth of smartphone progress. There's basically nothing to argue about here: Samsung is undeniably a master of display technology, mobile and otherwise. Is it really any surprise that the Galaxy Note 8's massive 6.3-inch Super AMOLED display still stacks up well against the competition? (Short answer: no.) Expansive 18:9 displays are becoming more common by the day and the bezels running around those screens continue to shrink, but the Note 8's bright, punchy screen remains one of our favorites regardless. Oh, and there's no notch here either: For some screen purists, Samsung still gets bonus points for that. If you're looking for a smartphone that comes with a stylus worth a damn, your search begins and ends with the Galaxy Note. Being able to scribble all over the screen has been a mainstay since the Note's earliest days, but the S Pen picked up a few more handy gimmicks when the Note 8 hit shelves last year. Screen Off Memo -- you know, the feature that lets you whip out the S Pen and start writing immediately -- was updated to support 100 pages of notes before you had to unlock the phone. Translating text became much more valuable, too, since you could use the S Pen to convert entire sentences and paragraphs from one language to another. The Note 7 only let you do that for individual words. And let's not forget Live Message, which I still use to whip up flashy GIFs that I blast around my social circles when I want to be obnoxious. (Needless to say, I get a lot of use out of it.) Throw in all the other S Pen features that have been added to the Note experience over the years and we're left with the most elegant stylus experience for a smartphone, period. Well, until the Galaxy Note 9 finally shows up. The Galaxy Note 8 was the first Samsung device to ship with a dual camera, and considering the company's skill with sensors, it's no surprise that the Note 8's camera is still one of the stronger options you'll find out there. That said, it didn't take long at all for the Note 8 to be largely outclassed by some of its fiercest competitors. Google's Pixel 2s made their debut just a few months after the Note 8, and even after plenty of flagships crossed our desks, we still consider them the best all-around smartphone cameras out there. As it turns out, Samsung's generally great optics couldn't quite compete with Google's phenomenal HDR+ image processing. (It certainly didn't hurt that the Pixel 2s also packed the search giant's Visual Core, a discrete chip designed to bring that sophisticated image processing to third-party apps.) 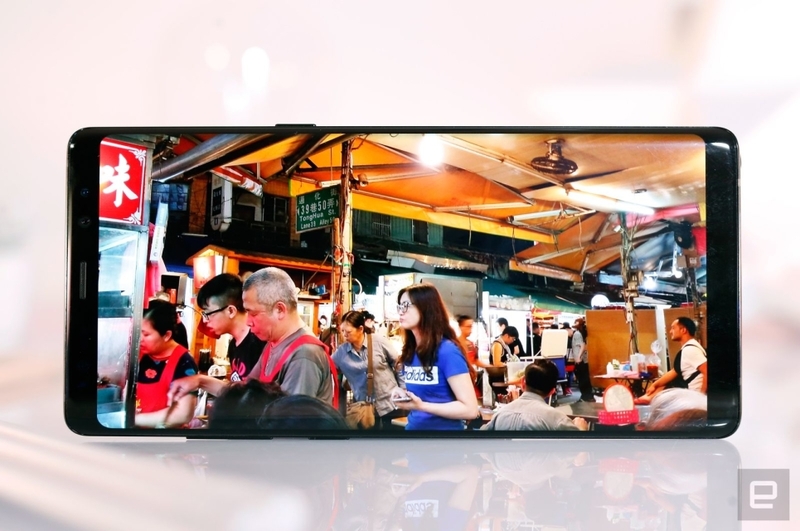 And on the hardware front, Huawei upped the stakes by crafting a triple-camera system for the P20 Pro that was far more than just a gimmick. The AI-fueled end result was one of the most immediately fun smartphone camera experiences we've had. Just months after the Note 8 was released, Samsung itself made that camera pretty irrelevant. 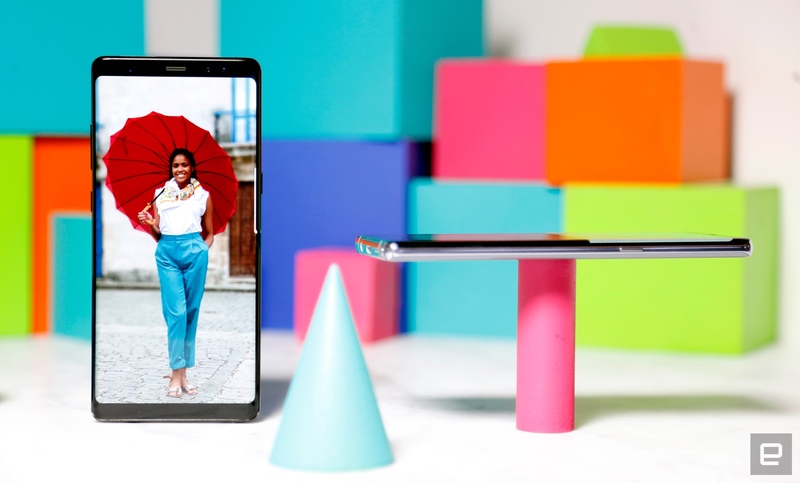 The Note 8 may have pioneered the dual camera for Samsung, but 2018's Galaxy S9 Plus made it dramatically more valuable: The introduction of the dual aperture gives the bigger S9 a distinct edge over the Galaxy Note 8 in low-light situations. It can be hard to spot substantive differences in photos taken on the Note 8 and the S9 Plus, but when you're in a bar trying to get the perfect shot? The latter wins every time. 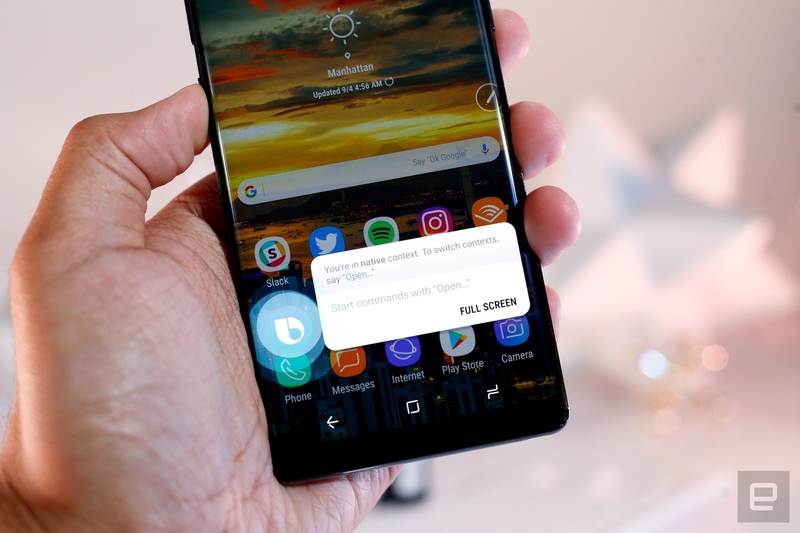 Galaxy Note 8s started getting their Oreo updates earlier this year, and the new software builds added some features -- plus some helpful tweaks -- to an experience we already liked a lot. It also added some pretty new clock styles for the always-on display. It was easier to send GIFs from Samsung's stock keyboard. You could install multiple instances of messaging apps like WhatsApp and Telegram. The list goes on. So why am I dinging the Note 8 for its software? Two words: update frequency. The Note 8 launched last year with Android 7.1.1, and Samsung took its sweet time adapting its Samsung Experience UI to new software: Oreo updates started going live earlier this year, and even now the Note 8 doesn't run the latest Android 8.1 update. At this rate, who knows when it's going to get a taste of Android 9.0 Pie? It's not uncommon for smartphone battery life to degrade over time, but my Note 8 suffered a notable hit when I installed the Oreo update earlier this year. In our original review, I pointed out that our Note 8 routinely ran for a full working day and that over quieter weekends, that figure ballooned to a day and half before it required a charge. Not long after the Oreo update went live, however, I started noticing the phone would lose more than 20 percent of its remaining battery capacity overnight. Others have reported the issue, too, and despite a couple hard resets to try and clear things up, that pronounced battery drain still pops up. A more recent Note 8 that Samsung provided us for comparisons didn't exhibit this issue, so it's possible Samsung fixed something in later production runs. That said, I'm not the only person to run into this, and it unfortunately detracts from an otherwise lovely smartphone. Based on the seemingly endless leaks we've seen in recent weeks, the Galaxy Note 9 is shaping up to be a valuable -- if not exactly groundbreaking -- update. We'd be willing to bet it gets the Galaxy S9 Plus' improved camera. At least one version of the phone should come with 512GB of internal storage. And despite a body that looks awfully like the phone it replaces, the Note 9 is expected to come with a bigger battery: Think between 3,850mAh and 4,000mAh. These are valuable changes, sure, but they aren't exactly game changing. The biggest change to the standard Note formula might be the S Pen's new role as a sort of Bluetooth remote control, and yeah, consider us cautiously optimistic. If Samsung can give people a new way to use the S Pen that doesn't just involve poking at a screen, people who otherwise wouldn't care about styluses may finally have a reason to go Note. If you don't already own a modern Galaxy Note, the Note 9 is the obvious one to splurge on. But if you're still proudly rocking your Note 8, don't feel any great pressure to upgrade: One year later, it's still one of Samsung's all-time greats.